An Amber Alert was issued for a California girl, Laylani Mosley, who went missing on Wednesday evening. The suspect in the case is Carolyn Ferguson, the child’s grandmother. 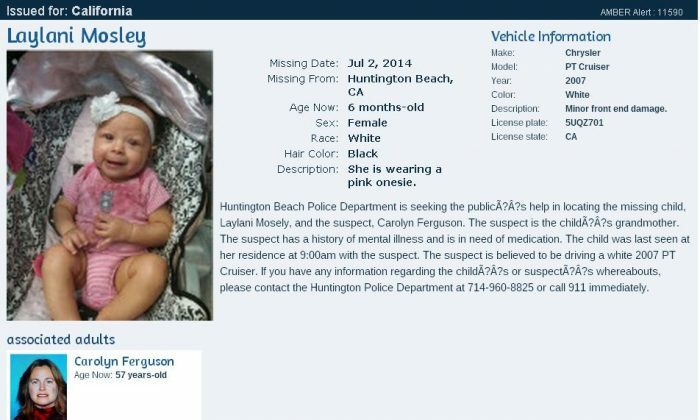 The Huntington Beach Police Department said the girl is six months old, white, has black hair, and was last seen wearing a pink onesie. Ferguson, 57, is white, has blonde hair, has blue eyes, and is 5 feet 7 inches and weighs 175 pounds. She drives a white 2007 PT Cruiser with a CA license number of 5UQZ701. The car has front end damage. Ferguson has a history of mental illness and requires medication. SAN FRANCISCO (AP) — A raging wildfire in rural Northern California that spread over 5 square miles and forced the evacuation of 200 homes in Napa County continues to grow, officials said Wednesday. By early evening, the Butts Fire in remote Pope Valley grew to 3,800 acres from 3,200 acres, said Daniel Berlant, a spokesman for the California Department of Forestry and Fire Protection. The blaze is not threatening any major vineyards, Berlant and a spokeswoman for a vintners association said. “We’re hoping that once the sun goes down, the temperature will as well and the humidity will also rise to give us another chance to increase containment,” Berlant said. The fire has damaged one home and four outbuildings. In addition to the mandatory evacuations, another 180 homes were threatened. No injuries have been reported, and the cause of the fire remains unknown.